A few weeks ago, when I was thrilled to be home from the hospital and able to continue on home Ivs to clear up my pneumonia, a friend of mine dropped off a care package, including a Food Network Magazine – the perfect gift! One of the recipes was for frozen grape kabobs. It got me thinking of what other fruits would be delectable frozen. I already knew I loved frozen grapes, blueberries and bananas, so I decided to experiment with other fruits. 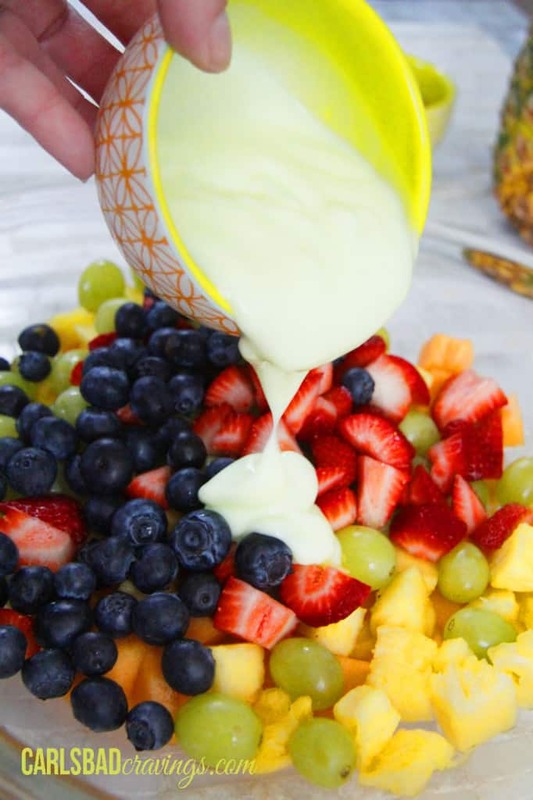 Have you ever tried frozen pineapple? They taste like candy! 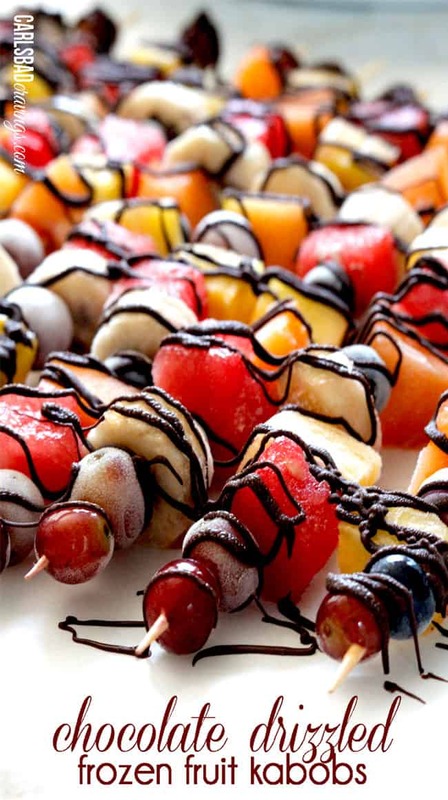 So how about a frozen “candy” fruit kabob? 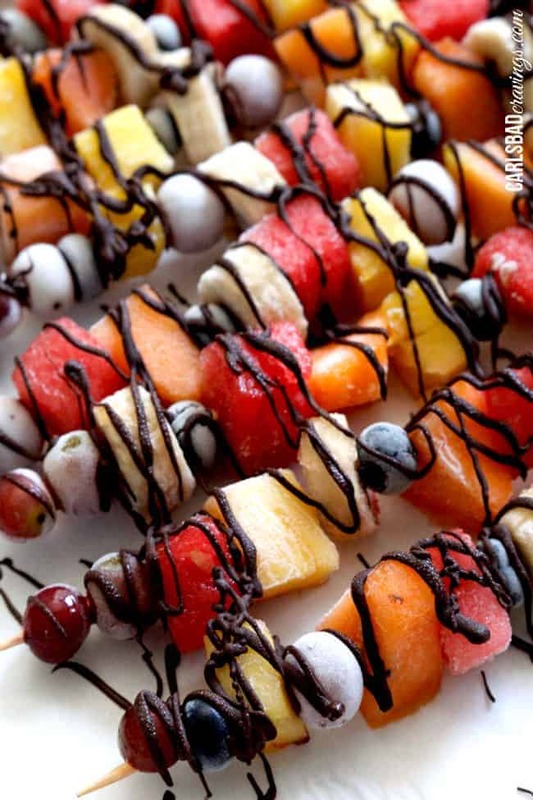 Skewer your favorite fruit to create kabobs, then drizzle with chocolate and you have a festive and light summer dessert, refreshing snack, or guiltless indulgence. 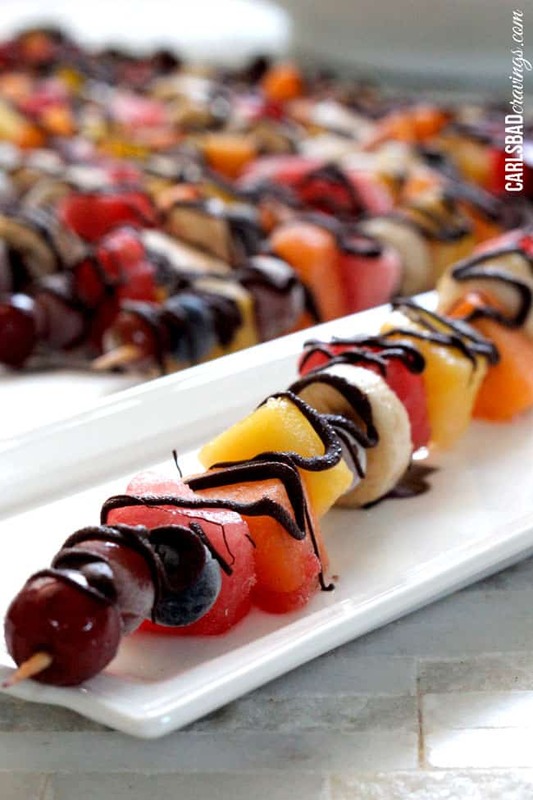 I also love that you can prepare these kabobs ahead of time – even days ahead of time. Truth be told, I made a double batch of these right before I went out of town last week and I am happy to say I am still enjoying munching on them whenever I feel the refreshing frozen chocolate fruit craving. They aren’t going to last long. 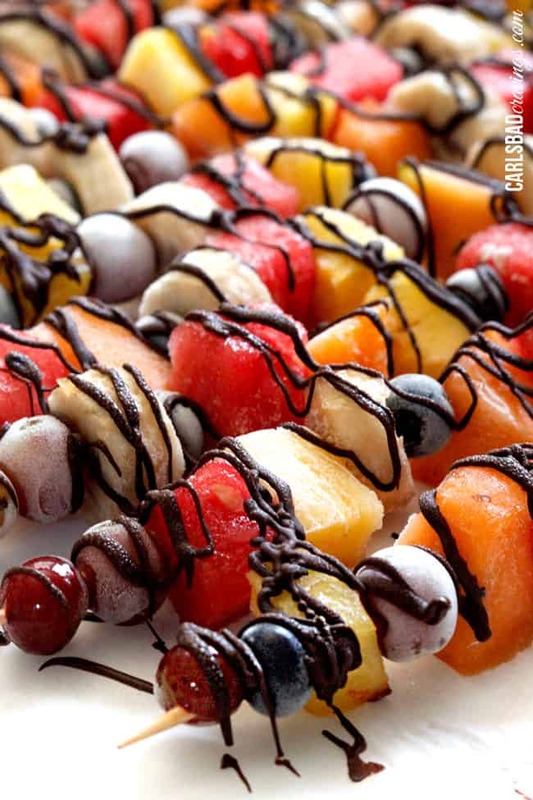 Chocolate Drizzled Frozen Fruit Skewers. Let it be summer year round! 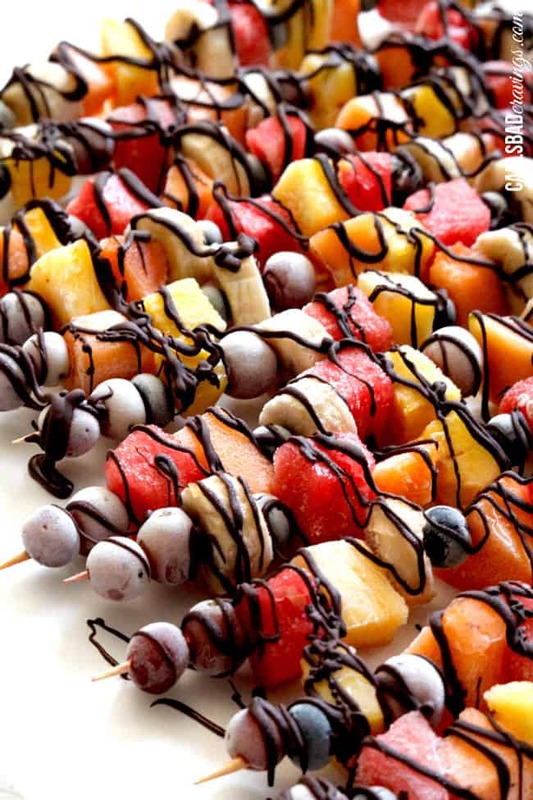 Thread fruit onto skewers, alternating fruit. Line kabobs on wax paper. Melt the chocolate in the microwave on low at 30 seconds intervals, stirring in between until melted, being careful not to overheat. After chocolate is melted and still warm, stir in shortening (NOT butter), until smooth. To create a perfect drizzle, add chocolate to a ziploc bag, cut off the corner and squeeze chocolate through opening. 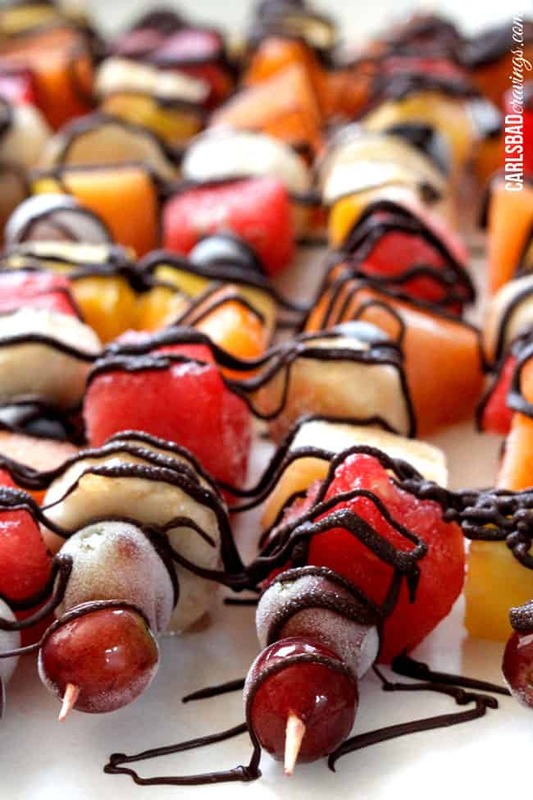 Freeze kabobs in a single layer on the wax paper for at least 2 hours before serving. When ready to serve, let kabob(s) thaw for a couple minutes but consume WITHIN 10 minutes because they melt/become soggy very quickly. 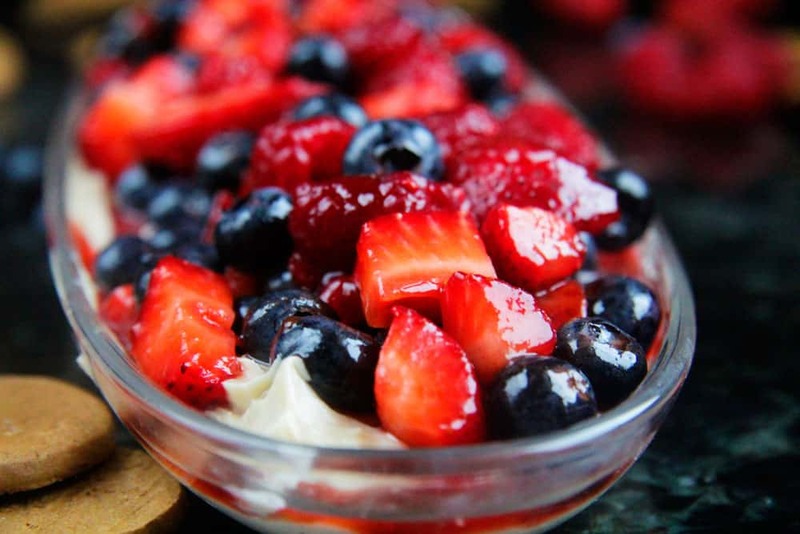 *Feel free to add more or less of the fruit you love, however, I have found strawberries to be too tart frozen. **Once kabobs are frozen, you can transfer them to a freezer bag where they will keep for up to 3-4 weeks in the freezer. 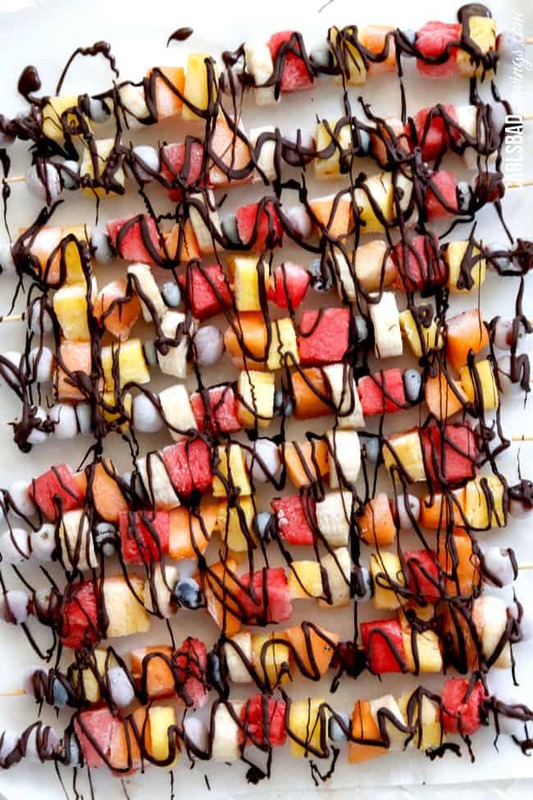 ***You can also drizzle the chocolate when you are ready to eat the kabobs - it can be easier to eat and less brittle this way. 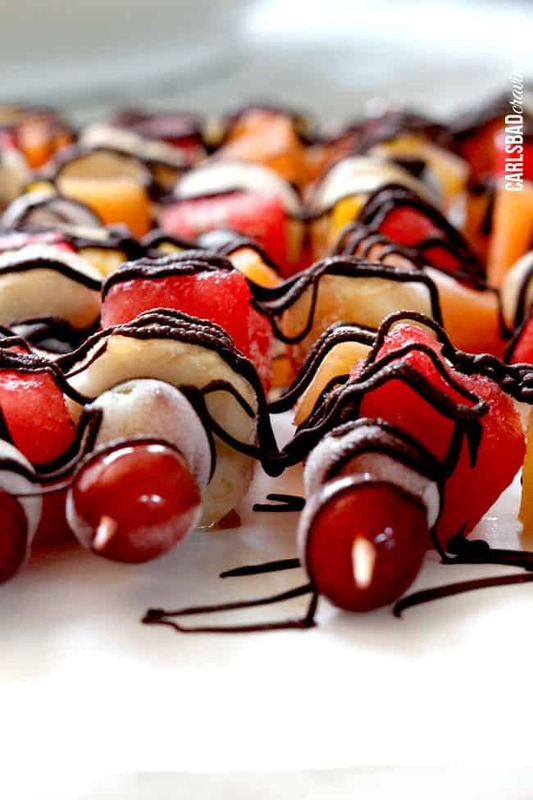 We love frozen fruit and have made something similar to this but skewed on a toothpick for mini kabobs for my kids. LOVE LOVE LOVE! These look phenomenal! This is so good. I freeze a lot of fruit especially in preparation for the winter. Those look so good! What a great treat for summer! These look amazing!!!! Thank you for posting. Oh my!! Sooo not good! 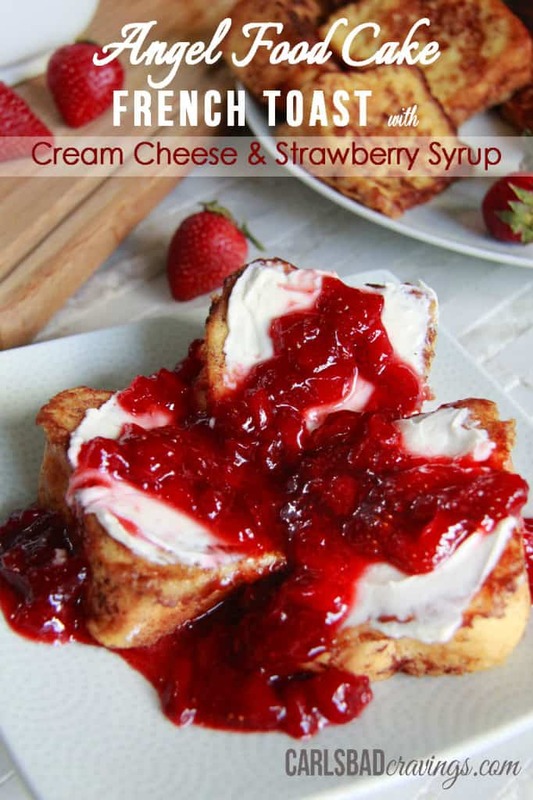 Those look delicious and I am hungry right now:) Will be bookmarking this page so I can come back later. Thanks! I like this … just enough chocolate to satisfy a craving but still healthy. Thanks! Oh wow! 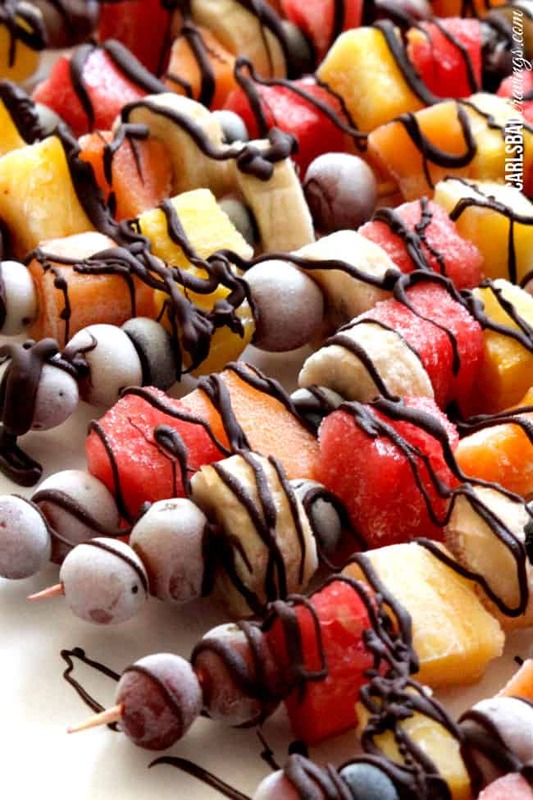 I’ve had fruit skewers before, but NOTHING like this! I’m so making these for our Labor Day barbecue. Thanks for sharing! That looks so good right now! I’m definitely trying this very soon. Thank you so much Stefanie! Fruit at the market last week was pretty poor looking. I settled with just grapes and bananas. The chocolate sauce was so easy and I used the Ziploc bag trick to make the pretty lines like yours. These were stellar, and a big hit with the husband. My little one got through about half because they were so cold. I think I will try the tooth pick versions for him next time. 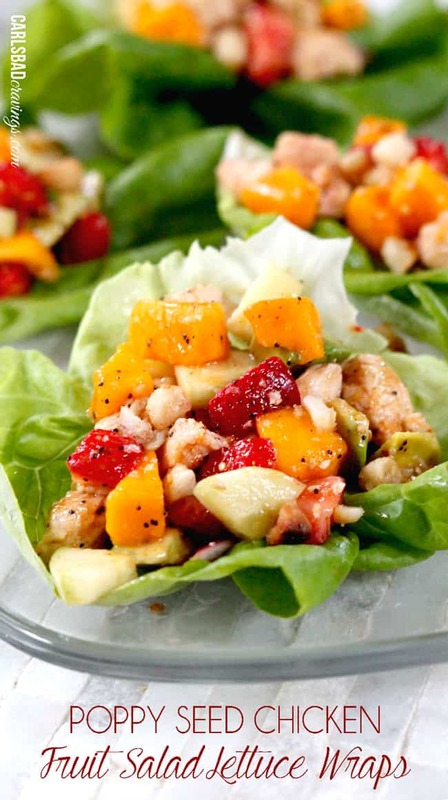 I loved how something so pretty could be so tasty and fairly healthy too! Thanks again for the great recipe! You are so welcome Angela! I love the idea of using toothpicks – super cute and kid friendly! 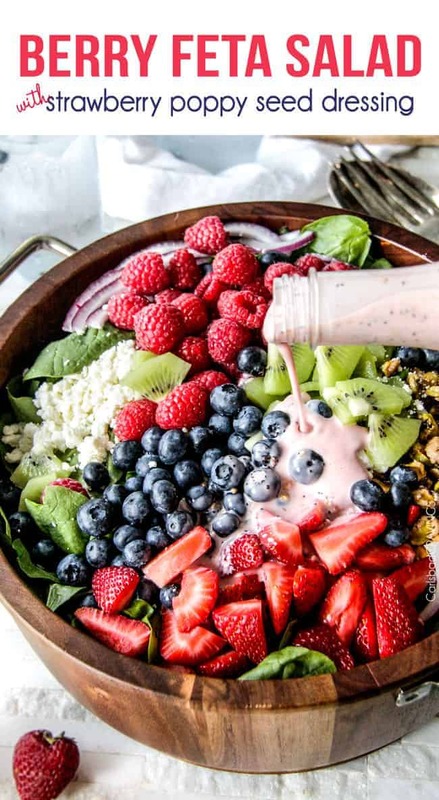 love it when tasty, healthy and pretty unite! Do you think I could make these ahead for a graduation party?? How would I prevent the “sogginess” issue? I want them to be able to sit out for a few hours as people come and go from the party. Hi Jane! You can definitely make them ahead of time but there is no way to prevent the “sogginess” issue as they begin to thaw when they are removed from the freezer. Sorry!